Over the years many people have asked me, "How did you get involved in all this work on Dr. MacDonald-Bayne's recordings and books?" or, "How is it that the wire recordings of Dr. Mac's lectures, given in South Africa, ended up in Canada?" I must admit that it does appear to be a rather remote connection at first glance but I will endeavour to explain how a chain of events led up to the ultimate task of reproducing his lectures for worldwide distribution after lying dormant for 25 years. In 1960 when in my early 20s, some books on yoga were recommended to me, which led to obtaining a catalogue from L N Fowler Co., a book company in England. I selected a few books but what really caught my eye were those titles of Dr. MacDonald-Bayne's books, and I was immensely pleased to read them when they did arrive. It was the kind of spiritual guidance I'd been looking for. How uplifting it was to have those subconscious, unspoken thoughts one has on spiritual subjects become clear and real perhaps for the first time. Eventually I obtained all of his books and they remained fond friends for years. However, it is all too true that when we are young we find ourselves so busy with living so-called life, contending with conditions, that we tend to skim the surface of things, never fully understanding the meaning behind it all. Gradually his books passed from my hands through lending and after a time only one was left, Divine Healing of Mind and Body, but even that went out on loan. It was in my mid-30s I began taking stock of the direction life was leading me and felt a strong need for deeper answers to life's questions. Perhaps some might say it was an inner call. Who to turn to? I could only think of inwardly calling on Dr. Mac for help then and had a compelling urge to acquire all his books again, which I did. From there I studied them for another two years, copying by hand, typing or reading aloud as Dr. Mac had recommended. Since I happened to work for a newspaper in Toronto I got the idea of writing to three newspapers in South Africa to make inquiries on what information they could provide on a Dr. Murdo MacDonald-Bayne who gave lectures in Johannesburg and Pretoria circa 1946 at Escom House. The Rand newspaper kindly placed an ad for me "Search for Murdo Fans" and it was not long after that I began to receive all sorts of lovely letters from people who were former students of his or who knew of him indirectly. It certainly was more than I had ever hoped for! I corresponded for 1-1/2 years with quite a few of these people who so kindly wrote to me of their experiences. Amusing as it may sound, it reached a point where I felt I must do something about this newfound connection or I'd burst! It resolved into a decision to make a two-week trip on my own to South Africa just to meet with them. Somehow everything seemed very right and just dropped into place. Off I went in October 1977, not dreaming what was ahead. Most important of all was that I met Paul Troxler in Pretoria, one of a few remaining students who attended Dr. Mac's Pretoria lectures over the years. While visiting Paul and his charming wife, Betty, at their apartment, he showed me a small carton containing an original wire recording of Dr. Mac's lectures. I had never seen such wire before and was curious to know more; took a photo of Paul holding the wire but as it was so fine it hardly showed up on the print. Paul's longtime friend, Louis Thomas, was in charge of all the wire recording done during Dr. Mac's series of lectures. 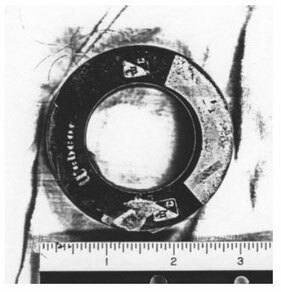 It appears that he kept the wires for some twenty years or so after Dr. Mac passed on in 1955, only occasionally allowing a magnetic reel copy to be given out. Then he decided to give away the entire batch of wires, along with a wire recording machine which didn't work unfortunately, to a friend of his in Upper Transvaal. 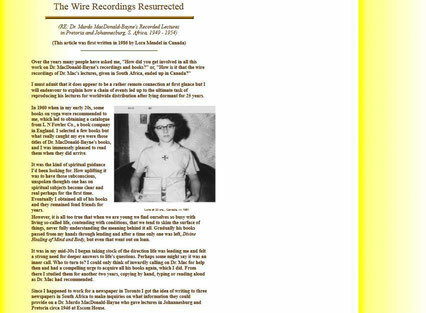 This person passed away and his son thought of placing the wire recordings in safekeeping with Paul who has been a lifelong devoted follower of Dr. Mac's works. I had just been corresponding with Paul for a few months when these events transpired. Paul mentioned in a letter having the wires placed with him and promised to send me a copy when they could do so, for me to hear Dr. Mac's voice and Scottish accent. Their wire recorder was presently out of order and parts were not to be had in their corner of the world, seeing that it was now virtually an antique. It was a real problem. At the end of my six days of visiting in Pretoria, Paul finally took me to meet Louis Thomas (he passed away not long afterwards) who, just before parting, gave me a 5-inch, magnetic reel copy of two of Dr. Mac's lectures. I was thrilled with this rare opportunity to hear Dr. Mac's voice but was unable to do so until my return to Canada when I had to borrow a friend's tape recorder to hear it. The experience made a profound impression on my psyche, and although at first it was difficult to follow some of his line of thought in the lecture, repetition rendered it more understandable. Many of his students had said it took them years to fully understand what he was talking about, and I know this to be true. Needless to say, I was very enthusiastic over the contents of the lectures and thought it a great idea to have a local recording company make up some copies on cassettes from the reel tape. I sent a sample cassette to Paul saying wouldn't it be a marvellous idea to have all of Dr. Mac's lectures available on cassettes. Little did I realize what I was getting myself into! However, the great stumbling block would be not having a good working machine on which to play the wires. I made an offer to Paul to hunt for a wire recorder in Canada or USA if possible and send it to him. Eight months passed, and two or three old rusty recorders and $800. later, I managed to obtain an almost new Webcor machine, but only on loan as a temporary exchange. So it turned out that Paul ended up forwarding to me by mail all the wires to be transposed here in Canada. As a test start, Paul sent two wires, The True Torch of Progress and Your Faith that Produces Works. I had expected to hire a recording company to do all the recording and proceeded with the first two, but a young technician -- no doubt in a hurry to get through the job of transposing a wire I'd left him with the machine -- had tangled the wire of The True Torch of Progress, used a sharp object to poke about to find the broken end, and hopelessly damaged this wire. My heart sank the next day when I saw wire strewn over the floor in the recording studio. It was only sheer luck that I had earlier attempted at home to play back on another specimen of a wire recorder this particular tape and had managed to record it also. It was all I had left to work on in future when preparing a master cassette. For Your Faith that Produces Works, I returned the wire to Paul by mail after recording it but learned later that it had been lost, which was the only one to suffer such a fate in the mails. At the beginning of 1979 all was physically prepared here and I had the task of transposing the recordings, over 100 wires, which first had to be played out to remove the dust of twenty years and checked for any flaws or shortcomings, carefully rewound back onto the original spool, then played again and recorded onto a 7-inch magnetic reel tape. From there it was transferred from reel to a master cassette, from which copies were then made. It took about two years of steady application during off hours from my regular job at the time. It is rather curious when thinking back on the chain of events, and moreso during the intensive work of recording, that the people around me who had a part in this are not here any longer. A gentleman who was president of an antique radio association, The Cat's Whiskers no less, and who put me in touch with the person from whom I borrowed the vitally essential Webster wire recorder (Webcor), has now passed on. A mutual friend from work who gave me much moral support is now gone to another province in Canada. A Hungarian technician who undertook the servicing whenever I had problems, and there were many, always seemed to phone or drop by when I was in a dilemma, wringing my hands in despair of what to do next. All seemed to be provided for. Often I couldn't help smiling inwardly to think that Dr. Mac was certainly on hand to oversee the proceedings! The assistance came to me when it was required and then another phase followed. It was indeed a lesson for me in learning to rely on the higher forces. I can distinctly recall particular moments when alone that I would suddenly turn around and look at a doorway sensing a presence although I could see nothing. And there has been only one occasion during sleep that I experienced a vivid dream of contacting Dr. Mac, in a sense he affirmed how much life is truly vibrant and real in the higher realms, of which we know so little in our world of effects and matter. One amusing episode occurred when I had to begin transposing the wires, knowing next to nothing of the mechanics but relying on intuition every step of the way. On the wire machine was a movable post over which the wire must cross while passing along the magnetic head itself. It acted as a kind of safety device, a brake lever, to regulate the tension of the wire while moving. Unfortunately, in this case if the wire happened to be a bit unsteady and caused a slight quivering tension, the lever activated the switch to stop the machine cold in its tracks. It also caused an abrupt stress on the tension and broke the wire most of the time. This sensitive little bit of apparatus caused me no end of anxiety at first as it was impossible to control. What to do? The words kept going through my mind of the first test lecture, The True Torch of Progress, of "taking off the brakes." That's just what I did! It was possible to tie the lever back from the path of the moving wire passing along, and from thereon the project went forward with fair success. No more surprise brakes or breaks. No other major catastrophies occurred, thank goodness. Anyone who has ever used a wire recorder will quite understand the challenge of operating one without mishaps. This sums up the account of my connection with the wires and it was with the assistance of many others that these recorded lectures were eventually made available to the public. It could not have been done at a more suitable time, since the advent of economical cassettes has placed Dr. Mac's lectures within reach of all who treasure his works. Reprinted with permission from L. Mendel, publisher, MacDonald-Bayne Publications in Canada. See English website at: >http://macdonaldbayne.homestead.com/works.html (Unfortunately that website doesn't work any more. Have a look at parts of what Lora's webpage looked like ... ) Lora's former webpage.